To get a ‘get’ or, in the parlance of Talmudic law, a divorce from an unwilling spouse can sometimes get complicated because of agunah – the term for a woman whose husband refuses to grant a divorce. "Without having the get ... I have no prospects of getting remarried. I cannot date men. I have no future…" says one woman trying to obtain a get from her husband. "It just literally locks you in. You're just entirely chained, &, in a sense, you're controlled." Whatever the circumstances, get this release from Holy Cacao in Israel that unlocks Marañón Canyon. Candidate for the most elaborate Marañón yet, both in terms of processing & Flavor. Certainly the most brandy-esque. Not talking any 'green banana' skank or short-ferment vapors either but seemingly distilled concentration. 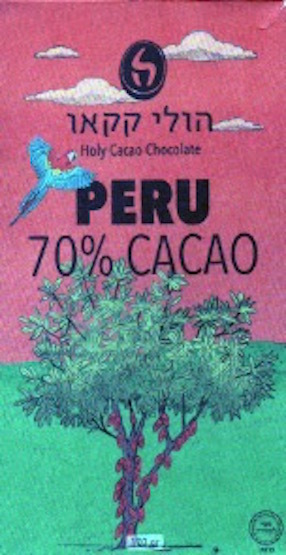 The level of customized detailing which Holy Cacao crafts into this bar -- multi-batches of varying parameters (stating more would probably breach confidentiality) -- attest to its commitment to bring out only the best & rivals the most meticulous in the artisan scene. Just shy of perfect on account of those fabric tags (possible methyl phenol compounds involved) as well as little core chocolate impression (despite simulating a bottom end that typically evades this cacáo). Still, an utterly unique & worthwhile interpretation of this origin-varietal.